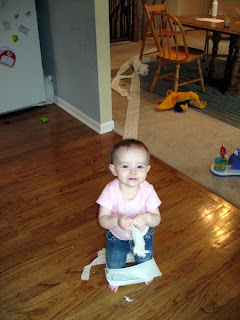 Our darling one-year-old just discovered the joy of toilet paper. 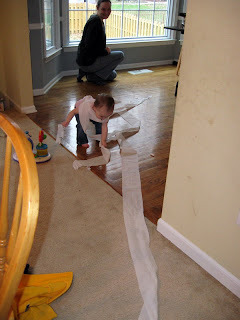 More precisely, how much absolute fun it is to start at the back of the house in Mommy & Daddy's bathroom and pull it through their bedroom, down the hall, across the dining room, and into the kitchen to show off her new trick. And of course, expecting cheers and clapping. 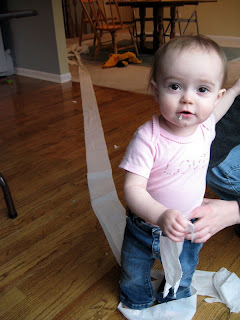 And what do you do when you've got all the toilet paper where you want it? 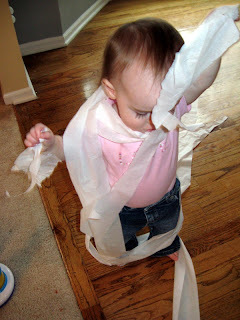 You wrap yourself up in a pretty paper dress and then shred it! The cheers and clapping are part of the fun. Anything that gets that reaction needs to be done again and again. Cute pictures!